$14 · Nautical Ease Inflatable Boat Products at Sherwood Marine!!! It's cleaning and storage season! 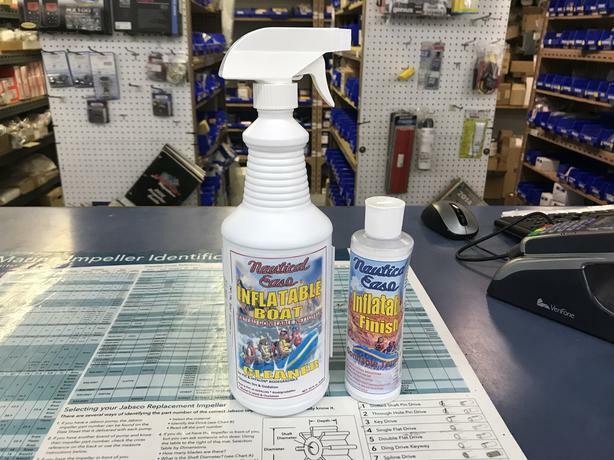 We have the number one product for cleaning your inflatable boat here at Sherwood Marine, we are also the Canadian Distributor for this product! Nautical Ease inflatable boat cleaner is an easy-to-use cleaner for both PVC & Hypalon inflatables. Dirt, white oxidization, and diesel smudge will easily dissolve. Also, it is biodegradable. It's "A Boat Show Every Day" at Sherwood Marine Centre! Sherwood Marine has the largest selection of new and used trailerable boats on Vancouver Island. Our inventory includes a wide selection of both aluminum and fiberglass boats such brands as Double Eagle, Hewescraft, Raider, Robalo and Weldcraft. Our Service department routinely handles all types of general boat repairs (gelcoat, electrical, plumbing, etc.) and as well as trailer repairs and conversions (disc brakes, electric-hydraulic actuators, etc). Our Parts department offers the best in-stock selection of OEM parts and marine accessories on Vancouver Island. Our experienced and friendly employees are here to assist you in finding everything from engine and driveline parts to marine electronics to fishing gear to safety equipment or barbeques! At Sherwood Marine Centre we strive to exceed our customer's expectations, and we look forward to helping you make your boat all you want it to be! Or you can check us out on our website at sherwoodmarine.com and Like our Facebook page at facebook.com/sherwoodmarine/ for regular updates on what's going on here!